With that said I am a big believer in Confidence Flies. 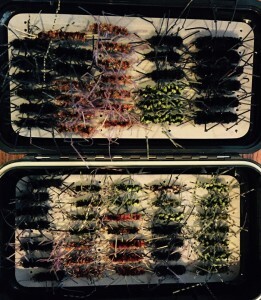 This entry was posted in Fly Fishing Life, Fly Tying Tips & Tools and tagged Confidence Flies, fly fishing life, Fly Selection on March 30, 2015 by Tom Lipscomb. 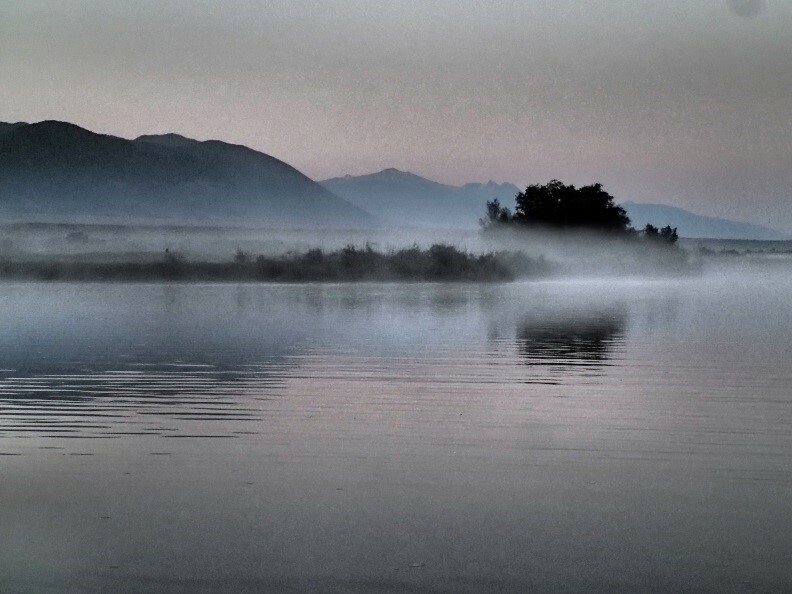 When I arrive at the boat launch on the southwestern shore of Ennis Lake, the lot is empty and faint glimpses of dawn appear behind the Madison Range. In mid-summer morning temps can be in the 60s and during the day they will rise into the 80s. This is wet wading time. In the Spring and Fall, crisp morning temperatures can bring frosts as late as June or as early as Labor Day. Waders are now essential. Before making the trip to Ennis Lake, I’ve checked the weather, especially the forecasted winds. Anything over 15 mph, especially out of the North or Northeast would have sent me to another river. Once the kayak and gear are ready to go I shove off from the ramp for the 15 minute paddle to the mouth of the river—the Valley Garden section of the Madison River. However, I have an immediate decision to make. Which mouth? It is barely five miles from the Ennis town launch site to the lake. But the Madison River, famous as the “50 mile riffle” begins to change character as it flows through Ennis. Historically called “The Channels” and routinely called Valley Garden because of the Valley Garden Ranch and the Valley Garden FAS, this five mile section of river is significantly different from the sections south of Ennis and below Madison Dam (north) in Beartrap Canyon of the Lower Madison. In Valley Garden the river flows through what remains of a massive meadow, mostly inundated when Ennis Lake was created in 1901. Within the first mile from Ennis town FAS, the first channels and islands appear, left and right along the river. The gradient slows, the bottom substrate become finer, the cottonwood trees thin out. The number of fishable channels is amazing. Any channel with any type of flow will have fishable water and hold fish. As the channels make their way to the lake, not one but six rivers enter the south end of the lake. Here the Madison holds rainbow and brown trout in impressive numbers and impressive size. In the lower reaches of Valley Garden, fish run up river from the lake to feed on good hatches of caddis, tricos and BWOs. Hoppers abound in summer. Browns make spawning runs in October. The lake and lots of stagnant dead end channels fill the river with leeches. Fish in Valley Garden are fat and feisty. But there’s one complication, the channels are surrounded by private land and this is wade fishing only. Regulations don’t allow fishing from a boat. There’s lots of accessible water around the Valley Garden FAS, but our Stream Access Law demands that anglers stay below the high water mark and off private land so once you reach the FAS boundaries you have to stay in the river. And the wade fishing only requirement, the complicated channels and the trip across the lake to the take out discourage a lot of drift boat drivers from fishing in Valley Garden. The paddle to the river is uneventful unless the early morning fog shrouds the few landmarks close to the river mouths. The river is usually a bit warmer than the lake and in those last minutes before sunrise as the last few degrees of cooling occurs; fog will form where the rivers flow into the lake. 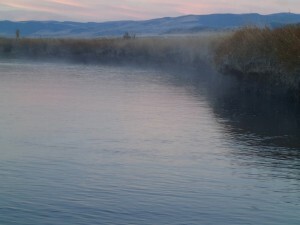 More than once I’ve found myself 100s of yards off target in the fog groping in the kayak for the river mouth. In the first few 100 yards where the river still looks like a lake but flows are perceptible, concentrations of fish will hold along obscure but fishable undercut banks. 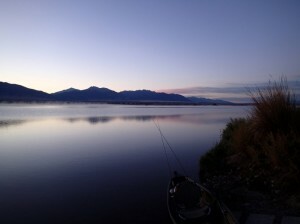 I reach water that is shallow enough to wade safely and begin the morning’s fishing. For the next few hours, I’ll be dead drifting large buggers, leech or crayfish patterns under an indicator as I move upstream with my kayak securely tethered to my waist. Every few 100 yards, it’s decision time, as multiple channels present themselves. Which one to take this morning? 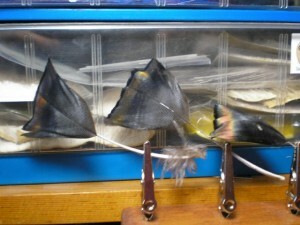 I’ve fished them all and each has their own lure. By mid-morning bugs appear and a few fish will be seen rising here and there. 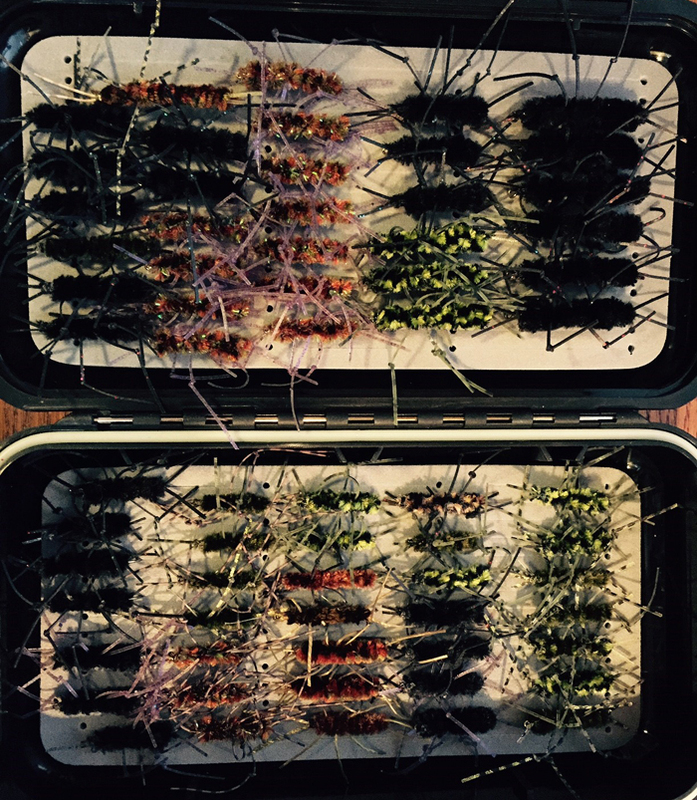 If it’s a warm day and still hopper season, I may breakout the 4 weight and toss a few foam hoppers at the banks. By noon, it’s time to turn around and head back. I may retrace my up-river track or return by a different channel. On the way back I remove the indicator from the 5 weight, switch to my 150 grain 30 foot sink tip and tie on a large streamer. I’ll pound the banks and pools with streamers most of the way back to the lake wading down, instead of upstream. Upon reaching the mouth of the river, I don’t forget that big fish hold in those deceptively subtle flows as the river spills into the lake and take a few more shots with the big streamers. The paddle back to ramp can be easy or challenging depending on whether or not the wind is blowing. As I clear the river mouth, if I see a dozen or so float tubes or pontoons chasing rises to Callibaetis, I’ll know the paddle back will go easy. If the lake is empty, there’s probably a good wind blowing and the paddle back will take longer. 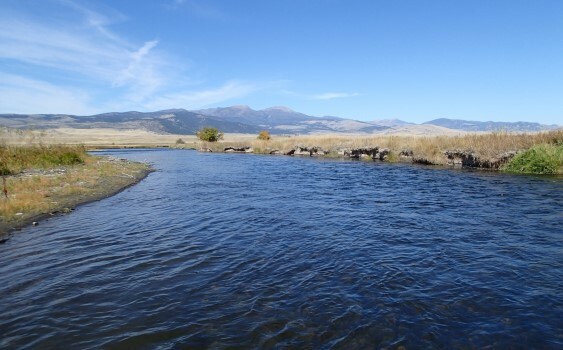 In those 15-30 minutes it takes to get back, I’ll reflect on the day’s fishing and start thinking about the next Day Trip to another Montana river. 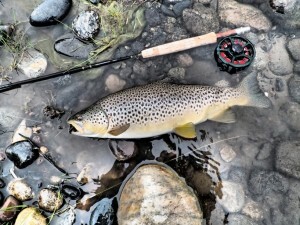 This entry was posted in Favorite Fly Fishing Spots, Fly Fishing Life, Mike Cline, Bozeman MT, Our Regular Contributors and tagged ennis lake fly fishing, Mike Cline, Montana fly fishing, trout fishing, valley garden fly fishing on March 26, 2015 by Mike Cline. This entry was posted in Fly Tying Materials & Supplies, Fly Tying Tips & Tools, The Art of Fly Tying and tagged Caddis Flies, fly tying instructions, fly tying materials, fly tying recipe, wing cutter on March 23, 2015 by Bob Nelson.